HONG KONG, Jan 14, 2019 - (ACN Newswire) - Organised by the Hong Kong Trade Development Council (HKTDC), the 50th edition of Hong Kong Fashion Week for Fall/Winter started its four-day run today and continues until 17 Jan at the Hong Kong Convention and Exhibition Centre (HKCEC). This year's fair, the largest of its kind in Asia, has attracted some 1,400 exhibitors from 11 countries and regions. In 2018, Fashion Week drew 14,000 buyers from 76 countries and regions, reinforcing Hong Kong's position as a key sourcing hub for global fashion traders and retailers. HKTDC Deputy Executive Director Benjamin Chau noted: "We are thrilled to kick off the 50th edition of Hong Kong Fashion Week for Fall/Winter today. What started out as a small-scale show held at local hotels has become Asia's largest fashion fair, creating many important business opportunities for exhibitors from Hong Kong and around the globe." Facing the uncertainties resulting from the ongoing trade conflict between the United States and Mainland China, together with rapid changes in sourcing and retailing models, Mr Chau urged industry players to grasp the opportunities presented by buyers from emerging markets, and stay competitive by improving design quality. Manufacturers also need to adopt the latest technologies to add value to their products. "Hong Kong Fashion Week is poised to remain as the ideal platform through which the industry can promote the latest products and exchange the latest information on fashion and market trends," said Mr Chau. Fashion Week incorporates various themed zones to cater for the sourcing needs of different sectors in the garment industry, from garments, designer labels and upstream products, such as fabrics and clothing accessories, to trade services and new production technologies in fashion. The Corporate Fashion and Uniforms zone returns this year and features the Hong Kong Designer Uniform Display, which showcases uniform collections from some of Hong Kong's top designers including Allan Chiu, Barney Cheng, Kurt Ho & Nelson Leung, LuLu Cheung and Mountain Yam. The World of Fashion Accessories also returns, bringing together items ranging from shoes and bags to fashion jewellery, scarves and shawls. New this year, The Federation of Hong Kong Footwear Ltd showcases its latest shoe designs with a fashion parade. Special product zones such as Fashionable Sportswear, Thermal Clothing, Bridal & Evening Wear and Intimate Wear & Swimwear feature the latest designs on offer. Incorporating the designs of 60 designers from different countries and regions, the International Fashion Designers' Showcase presents fashion masterpieces from around the globe under one roof. Six Hong Kong fashion designer labels present at "FASHIONALLY Collection #13" and three "FASHIONALLY Presentation" sessions during Fashion Week. Yeung Chin (brand name: YEUNG CHIN), Jane Ng (brand name: phenotypsetter) and Alee Lee (brand name: ALEE LEE) displayed their latest collections at FASHIONALLY Collection #13 today. The FASHIONALLY Presentation showcases the design works of local fashion designers Arto Wong (brand name: ARTO. ), Jason Lee (brand name: YMDH) and Carrie Kwok (brand name: CAR|2IE) through theatrical storytelling. Yam Chan, who comes from a fashion design background, is also collaborating with FASHIONALLY for the first time, showcasing his handcrafted dolls MICH at the MICH - ALLY Exhibition on 16-17 Jan.
Alongside the many fashion parades at Fashion Week, buyer forums, trend-forecasting seminars and sharing sessions on the latest production technologies will provide effective platforms for the industry to gather market information and exchange ideas. Leading international fashion trend forecaster Fashion Snoops shared on "The Visionary Fashion Trends for Spring/Summer 2020" today. Other seminars feature industry leaders and experts addressing issues such as rapid footwear prototyping, the sustainable development of the fashion industry, the cotton market outlook and the latest cotton textile technologies, as well as online-to-offline (O2O) retailing strategies. Hong Kong is a popular sourcing hub frequented by international traders, major retailers and chain stores. The annual Hong Kong Fashion Week for Fall/Winter is an important platform for buyers to discover the latest products and accessories. To create more business opportunities for exhibitors, the HKTDC has arranged 90 buying missions from 43 countries and regions, bringing more than 3,800 companies to the show. Participants include representatives from fashion brands, major chain stores and distributors from both traditional and emerging markets, such as the Czech Republic's Zoot, Indonesia's The Goods Dept, Japan's LEON International, Korea's Lotte Department Store, Russia's Forward, the United Kingdom's Temperley London, and 3NT from the United States. 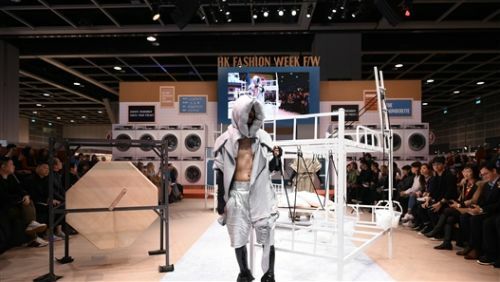 The 50th edition of Hong Kong Fashion Week for Fall/Winter marks a new era of connectivity for the fair. Through the latest version of the HKTDC Marketplace app, the HKTDC recently launched the new Exhibitor e-Badge that offers seamless access to the fairground. This initiative, together with the Buyer e-Badge introduced last year and the e-Business Card function, enables exhibitors and buyers to link up digitally simply by scanning each other's QR code. These exciting features strengthen connectivity between exhibitors and buyers, maximising information exchange as well as business opportunities at the fair. Since 1977, The HKTDC has been organising the Hong Kong Young Fashion Designers' Contest (YDC) to unearth talented local designers. This year's competition will be held during CENTRESTAGE in September and is now open for application. Find out more at www.fashionally.com/ydc_application. The 50th edition of Hong Kong Fashion Week for Fall/Winter, organised by the Hong Kong Trade Development Council (HKTDC), starts its four-day run today and continues until 17 Jan at the Hong Kong Convention and Exhibition Centre (HKCEC), featuring some 1,400 exhibitors from 11 countries and regions. Various fashion parades and seminars are being staged during the fair period.